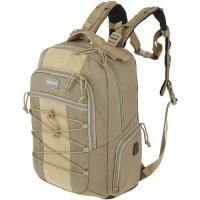 Maxpedition PT1390K, PT1390B Incognito Laptop Backpack FREE SHIPPING! The Maxpedition Incognito Laptop Backpack is a portable, protective carrying system for a 15 inch laptop computer. The dedicated pocket features high grade closed-cell foam padding for superior shock resistance and impact protection. The backpack also includes a locking CCW compartment sized for a large handgun, providing a discreet carry option that is both secure and accessible. The multi-compartment design makes it easy to organize your equipment effectively, and external PALS webbing means that you can attach accessories for additional versatility. The backpack is made from durable 1050 denier ballistic nylon, with reinforced stitching for additional wear resistance. It comes with a triple polyurethane coating that keeps water out, as well as a stain-resistant Teflon fabric protector. ©2002-2019 CopsPlus.com: Maxpedition PT1390K, PT1390B Incognito Laptop Backpack FREE SHIPPING!